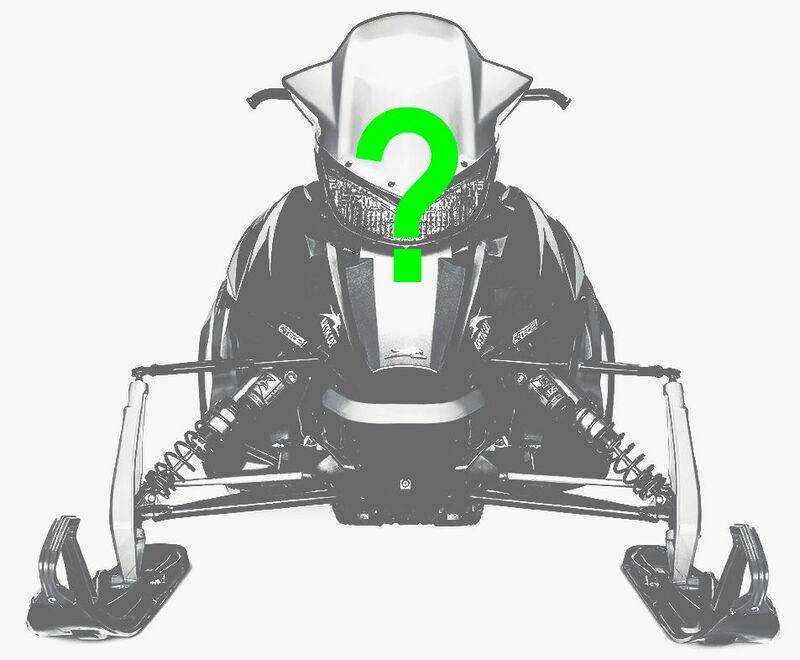 ArcticInsider - What Do You Wish For on an Arctic Cat Snowmobile? 1. A new gauge display that's about the size of an iPad Mini (about a 9-in. screen size). Maybe it's just a space in which I can attach an iPad Mini. This gauge can display the usual functions that current gauges offer, but it can also display some new stuff, perhaps via Bluetooth from my smartphone. What new stuff? - The trails I'm riding, including my exact spot on the trail, similar to the Ride Command app. - A pre-configured route, including where I'm at along the route. 2. Knock 50 pounds off of the ZRs. I'd REALLY love to see what a 100-pound lighter ZR would feel like, but for now I'll shoot a little lower and ask for 50 pounds. I don't know exactly what this looks like or how it's accomplished. Probably it's part design and part materials. For sure it's more expensive. 3. Make 'em more narrow (or at least feel more narrow). - At 5' 8", I'm not about to enter the NBA. The current seat/tunnel/tank area feels fine when I'm just cruising. But it's a bit too wide when I channel my inner Bobby Flame. Remember the Firecat? I do, and I loved their narrowness. 4. Make a traditional mountain sled that's as flickable and confidence inspiring as the SVX 450 snowbike. - I ride in the mountains once or twice a year. When I do, I want to be able to thread through trees with absolute precision, rip a sidehill like McClure and Kincaid, and put the sled exactly where I want every time I want to do it. I felt that way when I rode the SVX 450 last winter. 5. Double the lighting output. - My eyes are worse in low-light and dark conditions now compared to five years ago (which is to say nothing about what it was like 20 years ago!). The LED headlight that Cat introduced a couple years ago is a BIG improvement over the halogen system, but I still think I would be happy with double the light output of LED system. 6. Let me adjust the suspension (for conditions and how feisty I'm feeling) while I'm riding. Nuff said. 7. Make a CVT system that never needs adjustment and that always delivers optimum performance. Wait...Arctic Cat already did that with the Rapid Response II and Rapid Reaction drive/driven clutches. Thank you Arctic Cat! Those are mine, what are yours? #4's going to happen (much) sooner than later. Whatever Cat decides to build, I hope a little more attention to detail and quality are made. Also, get rid of the TCL; design a decent chaincase (with drain) and a separate oil tank; add a real snowmobile gauge (not motorcycle gauge) that doesn't rattle; new switches; better and more flexible storage options that integrate into the tunnel. I'd love to see slides and idler bearings last a little longer than they do. More options for ordering spring sleds and not having the highest prices would be great. Finally, stop the ridiculous practice of not publishing sleds weights. Even if you don't have the lightest sleds there's no reason to hide this information. If AC is concerned about the perception of sled weights, build a sled that doesn't make so much tunnel ice. I gotta say -- good job AC on the 2S motors. Keep up the good work with the powerplants. Funny to read this list, before the show, but after the media has seen/ridden the new iron. so how many of the "wishes" will we see?? I'd like to see the quality and fit/finish equal to skidoo so when I'm shopping I don't feel like I'm getting an inferior sled when I'm looking at the small details. I love Cat and always will, but when I'm looking at a zr sitting next to a Mxz it's undeniable there's a big gap in the details... also if they could find a way to help Arctic Insider churn out more of the best snowmobile related articles available I'd be thrilled!! This is the best article you have ever put out, John. Hopefully Cat (Textron) is listening to us. Skidoo has easily walked away with most of the market share of this declining market due to fat A/C upper management and cheap product output....and a darn good product. With little R&D $ for the last decade, it may take a miracle to get Cat back to where they should have always remained...#1. Lets start with hand warmers that actually work, bearings that last more than a season, a headlight that keeps us safe at night, controls and a display that is at least from the 2000's, and pricing that relevant to what we are purchasing. Sorry, but A/C not deserve to be the most expensive. Sorry...step it up and we will pay. Losing the weight is a double edged sword. If you make it too light, it will get totalled with a small impact, like a Ski-doo. Just ask an insurance adjuster. I too would like to see the weight drop, though. The chaincase drain would be nice. Should give you a windshield option at the dealer level, when you pick up your sled. You spend 13 grand on a sled, now you have to fork over another $150 to buy a shield that wont give you frostbite. I agree with Russ make them to light and they will bend like a toothpick. I had a little accident with my 2012 procross I got caught on a railroad bent the a/arm and tie rod lucky I was going slow. I asked the adjuster would there be less damage with another brand he told me if it was a doo I’d be totaling out you’re sled. They are the worse sled out there when you have a impact. If there are any doo fans reading this he showed me his list of accident reports for the year almost every doo that had impact or caught something hard was totaled. It made me feel good when he told me I was ridding a well built solid sled. I’d like to see better gauges hate to say it but Polaris has a really nice gauge. Better fit finish with panels, paint that doesn’t come off,better storage,bearings,chain case,not having to worry about belts blowing, led lights so we can see, and pricing below ski doo that would sell sleds. A product that would win back past cat riders make doo riders jump ship to be on a cat. Textron has their work cut out for them especially in a weather dependent sport. But I believe a company like textron sure has the resources to get cat there and hopefully they will. Time will tell. I'd like to see a snowmobile designed to channel the wind around the driver. The first ride on my 2018 Cross Tour was the coldest ride of my life. The windshield is to far ahead of the driver and ineffective. The next day I forked over $125.00 for the high windshield that didn't work much better.The body is just as bad. I installed the optional wind deflectors that mount on the body side panels and all they did was deflect wind and snow dust into my knees and lap. Spend a few bucks and test these machines and accessories in a wind tunnel before you market them to us. Another issue that should be addressed is the cooling system. You shouldn't have to purchase ice scratchers to be able to ride your new snowmobile down a groomed trail with out over heating. Please give me back a radiator! I'd like to see a better rider support program. I ride freestyle and backcountry and all my film appearances sell a lot of sleds. Me and my friends need support for this. We spend a lot of time filming ourselves and making videos that showcase our talents. A new gauge display already exists. It is called The NS1 gauge and is available from www.nextstagegauges.com. That display uses a 7" tablet and has a built in GPS. Tom, if you think a Procross is cold, try one of the other brands. Except for the Twin Spar, the Procross is the warmest thing out there. For god sake, get the mapping right. Every Efi cat I,vet owned has been pig rich(especialy engagement to 5000 rpms). Owned a carbed f-7 black widow and was spot on. Sick of buying boondockers to clean up the overfueled cats. Chain case needs to be more accessible so we can change oil and make adjustments. 150 horse is not acceptable in an 800 cc sled. The composition is blowing our doors off cat. Be a leader, not a follower. WTF??? I don't care what the snowmobile would look like. I just want an Arctic Cat snowmobile. POWER STEERING on the Bearcat and Pantera. The first thing Arctic cat needs to do is get their sales in order for the guys that buy them. Every spring cat discounts the sleds so badly anyone looking to sell their sleds they get nothing for them. A lot of dealers even sell so differently priced its just insane. They really need to make darn sure that the people are not getting slaughtered on used sleds. It's pretty bad come spring when dealers are selling brand new sleds for less than what the used market should be. Painted tunnels on all new sleds, and a clear plastic oil tank. Better handlebar controls, and better skis. For god sakes bring back the top end speed. The 2 stroke 600 and 800’s get killed by the other brands out on the lakes. Nobody I ride with wants to run out and buy the one that consistently comes in last when we are racing each other. That is why most of my friends have switched to ski-doo or Polaris. Better weight transfer for fun on the trails would also be nice like Jamie Attridge said. I currently have to take my coupling blocks out to achieve this. Bigger better gauges, handle bar warmers that actually work when it’s cold out and wheels that don’t delaminate in the skidframe after 200 miles. Give me a stock sled I don’t have to stick 2k into it to make it perform like the competition. Performance sells Textron and if your stock sleds are faster then the competitions they will sell and sell well! Just wait until the electronic suspension fails. The term ditch pickle will be revived. This livestream looked like some silicon valley circus sideshow with the snakeoil salesmen doing the rah rah routine. Im insulted that they think we are that stupid to listen to the baloney they are spreading. Hey fellas, why dont you discount some of that noncurrent inventory that you hung all your dealers with? How about the great resale on 2012 and 2013 turbos? 1: A vented oil cap that doesn't leak. I have the NS1 gauge system and it's what Cat needs to be furnishing on customer sleds, while the lighting has improved with new LED lights it still doesn't compare to the lighting I had on my Z1 Turbo after I replaced the bright lights with HID lamps......Oh and as always how about a larger gas tank! A large gas cap like the firecats had. ZR7000 with 150 Hp. Enhanced version of the analog/digital Deluxe gauge-- make it so it gives more info on the Digital side, but still offers a needle gauge, so much easier to see at a glance. More Horsepower in their respective classes, as Jamie and Hawk are correct. Chaincase improvements like Hooper mentioned. MUCH BETTER HEADLIGHTS!! -Revised rear snoflap that allows open unrestricted access to the rear bumper. -Non-leaking oil cap (for M series sleds that spend some time upside down). -Spare belt holder mounted under hood somewhere. The IACT is interesting and looking forward to see how that works out. 1. Newer chassis that is little more aggressive seating position, little the Polaris Assault. 2. Improve the fun factor, able to wheelie easier over the bumps, like the Polaris. Keep the body panel the way it is, I like the looks of it. Maybe improve the fit and finish. I can't speak for the 800 dsi power since I haven't rode it yet. But I did ride the 2018 Polaris 800 assault and it has awesome power and spot on clutching. Snappy power. I can't wait to see what Cat brings to the table for 2020! A bigger gauge like john mentioned would be nice. A screw type cap to replace the rubber one on the chaincase fill hole.Mine always leaks. How about giving sno checkers the choice of color they want.I would like the hood to be green on my 2019 zr 6000 sno pro es.Like last year there is to much black. Other then that, no really issues. Some nice upgrades but I think some key pieces remain needed. For me, however, I can’t justify spending today’s coin on a third Procross. Ultimately, sales will be the verdict on the 2019 line-up. I hope AC does well. High country 8 with alpha skid and electronic adjust q3 shocks. A real gauge with navigation. A drain for the chain case. Textron brass wearing GREEN at Arctic Cat events. 1. Gauge ( A gauge with gps, navigation, smartphone compatible, and to be able to download updates, kinda like tesla can do with their car for performance wise).. Overall a die hard Cat guy but recent years have seen more Ski-doos and a Polaris enter the shed before a new Cat. Besides country cat, which is no where near the closest dealer, don't hear much from the dealers when I go into the store or browse online. I think Cat can become bigger and better then the other guys.... It won't happen overnight, but everyone loves a comeback story. 2. Make ZR's typically a 2-stroke, i.e. ZR 600, ZR 800. (And lose the extra zero, i.e. ZR6000. 3. 4 strokes use older names associated with HP class. The current ZR3000 would be a Jag, ZR7000 would be a Wildcat (It's a sled name! Lets get it back!) similar to the current Thundercat. 4. That Wildcat gets that new motor. Ideally around 140-150 HP. Better filling the gap between the 6 and 8. 5. And speaking of gaps, how about a 440/500 class 2 stroke around 100 HP? 6. Make the Limited sleds a true Early Order. Let the buyer order to suit them. Engine, shocks, track size (glad to see a 1" track back, make it available to all, both 129" and 137" and, for Pete's sake, lose the Quiet Drive inner track tumors. A nightmare for guys like me that are picky about stud patterns and scratch lines), windshield height and maybe some level of a color choice for skis, bumpers, slide rails, panels, etc. 7. Maybe a docking area for smartphones. I use mine with a trail app and would love to have it visible and charging. One a side note, how come no prices listed on Cat's website? 1. True spring order program as others have stated. 2. 100ish hp class motor. For me a 4 stroke would work. 4. Block heaters on 4 Strokes. 5. Low snow kit - retractable ski wheels and some form of Slider lube that can be turned on off. With shorter, low snow seasons this might get us an extra weekend or two when the trails are still good but roads are bare. 1. Lose the Quiet Drive Track on the performance models. PLEASE! For those that stud it makes it difficult and create more noise and idler wheel wear. 2. Improved gauges. Cat's are the worst in the business and difficult to read the coolant temp's etc.. I also went to the Next Stage 1 Gauge for improved readability and the GPS capability. 3. Allow spring order buyers some choices other than color. 4. Changing compression rates while riding? I hope this works over the course of a season. Seems like once I get my sleds dialed in I do not seem to do much changing. And it only takes a minute to change the QSR shocks. Seems like a gimmick? Not something I would pay much extra for. 5. While not a mountain rider the new mountain mono rail looks like a winner! Great job! 6. Need compression adjustments on the front track shock. Please. 8. Fit and finish is much improved on my 2018, but it seems to be louder and vibrate more than the competitors sleds. 9. Colors - While I like the purple accents on the mountain sled I find the Limited sleds color selections not for my taste. Go from a purple sled that I can not seem to like what so ever to a boring black. What color are the spindles? Again to reflect other peoples comments make the spring order a real spring order so you can get the shocks, tracks and graphics that you want. Seems to work well for Polaris. The std ZR/Sno Pro graphics look great but I want the better shocks. 10. Hopefully we will get to look at some of these sleds before deciding to purchase or not. We need to get younger people into this sport and we need to get the entry cost down. The ZR200 was a step in the right direction, but the next step is obvious, yet very challenging. We need an updated version of the Jag 340/Puma 340 IFS sled from the 90's, and we need it to sell for no more than 4000 dollars stripped. How do you do this? Use proven technology. It has to pass EPA reg's and be stone axe reliable. So to me, a two stroke is out. Use a large bore air cooled four stroke single of about 30hp. It might even be a more conventional chassis, similar to the old ZR of the 90's. Not every sled has to be a rocket, some just want to ride something economical and reliable. Yamaha sold thousands of Enticers for almost a decade and they were not cutting edge tech, but they did run almost forever. Put me down as one that would like to customize my new sled. It would be nice to go on the Cat website and choose, track length, windshield, engine size and the different colors you want and where. Also options like, scratchers, mirrors, tow hitch, heated shield plug in and etc. It would then show you what it looked like and the MSRP. This way you would get what you want or imagined without guessing what it may look like. Cat could build the main sled at the factory and the dealer would then add the items that you chose or the factory could do it. Just like how the vehicle manufactures do it. I would like mode controls on the engine for mileage or performance, better headlights, a 140-150 horse four stroke that is only 20#s heavier than the 800, better top end, better graphics, 2018 and 2019 are a letdown except for the Thundercat. [FUEL CONTROLLER or] get the mapping right. Finally, stop the ridiculous practice of not publishing sleds weights. 6. Make the Limited sleds a true Early Order. Let the buyer order to suit them. Air Vents and Intake. The current body styles have a mess of heavy plastic. Minimalist Mountain Sled. Shear Bolts, the bulkhead and Arms are strong enough- let something else break. We’ll carry spares. Get rid of the terrible snow dam design, you NEED A PLANING NOSECONE. And seal all the holes. Learn from Water Skis, last decade of powder skis and fluid dynamics- these cats are a drag in deep pow. Eliminate the windshield, just mold the plastic around the BIGGER, BETTER GAUGE. A HOOD! Please bring back my hood to fill oil, check coolant levels again and have a hot dogger! Hot Dogger or muff pot. Belt Drive, or at least an option. Extra Belt(s) storage. SIMPLE STEERINIG POST, and FORWARD!! Get rid of slop, ball joints, bushings and weight. ADJUSTABLE or Choice in steering riser block height. Handlebars are for Brake and Throttle only. Buttons, Kill Switch, Accessories belong on the dash. LED needs a SUPER BRIGHT option. Otherwise many just delete the stock crap. LinQ accessories- can’t beat em, join em. Make it a standard platform, then build better accessories. BEST BUMPER IN THE BUSINESS, just needs a sleek minimal tail light. THINK TINY! It’s your business, but profitability should be the goal- not gross sales. We are demanding things only the aftermarket scabs offer. We are willing to sacrifice price for belt drives and weight loss; warranties for tuning, horsepower and turbos. Make a 10,000 incremental sled, and a 20,000 high performance machine. Take some bigger chances because T Motion was a hit, then the aftermarket offered promotion from Ice Age Rails- which served us fine until the ALPHA finally came. Now we are asking for a less reliable sled... Funny how this has gone full circle lol. Carl-that sled with the buttery weak linkages and sacrificial parts already exists. They call it the RMK. As for me, No thanks. I don't even like to ride with guys who have that fix on the mountain attitude. Been there wasted hours waiting for them to fix their junk, ruins everybody's day. A couple pounds ain't worth it. Keep finding ways to shave a few and new ideas like the alpha, but remain a sled we can "Ride More". That should be the goal. How about 900 triple based off of 600 del stage injection with the electric oil pump and would give us choice between 4cycle triple or 2 cycle triple,but lighter than what is available for triples know,with good dependability.the procross chassis is great,and would be hard to improve on right know just plastics and small improvements awsome chassis. Put the 21 click adjustable shocks back on the RR and 600 cross country race sled. The guy that buys this type of sled wants to be able to make small independent adjustments to any shock. Some people are still capable of setting up sled shocks. If this is not important to you than you buy a ZR without the RR package. Bring the cluster up to this century a nice looking functional cluster would be nice with a clock , gps and a fuel gauge that works. How about letting buyer pick the options on a new sled ie. skis ,track, seat style, windshield, shocks, carbides, color, accessories. One last thing a belt/clutch temp warning light or gauge, could even be in the new cluster. This could save a lot of belts when riding off trail in heavy snow conditions. Simply knowing you are overheating you belt/clutch and you need to let it cool. Just wrote a whole list of things but it didn't post for some reason so here's a shorted version in case it doesn't work again. I bought a 2018 snow check select Switchback Assault this year after bleeding green my entire life. Cat needs to build a crossover comparable to this sled to earn my business back. New starter on the handle bars are great,new wheels on the back are also great. But i have a 2018 zr 8000 ice buildup in the tunnel is just terrible and overheating is not good light comes on at 156 degrees is that normal? You studded Clark? My 18 6000 does not get much ice build up but no studs. I do run scratchers most of the time. These sleds sit so high that it takes alot of snow dust to cool them. Studded tracks add to ice because of the added aluminum stud protectors that do not get hot enough to melt it away. Strong product support from the manufacturer is a must and would be appreciated. We have some of that already but, when customers need parts for their broken sleds in January or February and those parts are sold out or are on backorder till summer then no one wins. How about something as simple as working with your dealers, I personally don't know one local cat dealer that isn't thinking about dropping cat completely. Build a sweet $7500 sled like the snopro 500 with reverse. -New rear end of the two piece tunnel, one that doesn't brake or bend! Maybe make it a little shorter? -New 2-stroke engine that leaves the 850's in the dust, maybe a 900cc dsi with two fuelinjectors per cylinder? Maybe with a supercharger as well? Just to reach 200 class hp or more. With other words, create a beast! -also, put the monorail in more than one snowmobile! -take back the big old gas cap. -make a scandinavian version of the m-line with a 150" track with 3" pads and the monorail and with a new beast 2-stroke engine. With the i-act suspension and a telescopic raiser. And loosen it up a bit to make it a wheelie machine that performs in the bc hills. ZR5000 Sno Pro(2 stroke) without electric start. Cheap shocks and gauges on base ZR? Don’t disgrace the ZR image with generic parts. Name them Puma and Cougar. I do like the 19 ZR7000, but crap shocks and gauge for $12K? Really? I guess I’ll keep riding my 05 F6 Black Widow Sno Pro. I ride the Mountains in Utah. I end up spending a ton of money on stuff that should be available on a stock sled. 2. Multi Helix secondary with adjustable weights and heavier primary spring. 4. Short snow flap. The factory one is a snow scoop when side hilling or in deep snow. 5. Running boards catch too much snow. The should come stock like the after market ones you can buy. 6. More mounting room for additional gauges under the handlebars. There is no good place to mount boost gauges and turbo controllers. 7. My pull rope is gets caught on the ignition coil all the time. Reroute the rope or put a guard over the coil. 8. Maybe some more graphic selections that are a little more flashy. The Seats on the ZR for groomed trail riding, needs to be a little higher, because when you sit down on it, you sink to much and then your hips seem to be level with your knees. I think you want your hips to be slightly higher. New Gauge pod (as I mentioned before) and cleanup that guage cluster area to make it more appeasing to the eye. Also, Ice ripper tracks should be standard on all ZR trail model instead of the standard ripsaw. Find a place for the belt on the side panel. Make something where you can clip a belt on one of the side panels. Make one side a little wider? Oh.. the dreams! The desires. Ahh.. OK, realistically, I would love to see Arctic Cat get back to roots.. Before the mess they made. I am talking about why did they drop the Panther! Have to have the Panther! I was disappointed when they dropped that model because I was expecting a 50th anniversary of the Panther. Now that date has come to pass. I am bitter disappointed. And please drop all those letters! Well, keep the Z name. But return the good old names. Would be nice to see Kitty Cat name back so is the Panther, Cheetah (Norseman, really!? Yuck! ), and others. Only I am glad the Pentera and the Thundercat are back but I prefer the ElTigre` name to be remain. Lynx is another name I am glad it is on and it is rightfully belongs to Arctic Cat, not the other Lynx from Europe! Also children sleds.. come on. Let's bring back the Puma and the Jag names for them. If Arctic Cat is going to make the children 300cc sled, might as well be called Jag or Puma. Now, about the design. TOO busy! I like to see more clean up design like the way it used to be in the 1970s and 1980s. Love those clean lines. Not too many lines! I am not talking about graphics, mind you. I am talking about the design of the cowl, panels, etc. Because of the rider platform some of us may not like it. I like the way it used to be. Lay back riding like the old sleds and LOWER it please. AND smaller please! Kind of like the 3/4 but more of 4/5th of the sled for ADULTS my size (I am merely 5' 2.5") and I prefer like the old sleds. Lower travel, belly pan, and shorter sleds. I also like to see maybe leaf suspension come back? Some of us like it classic! A real retro. No brands actually made it retro. Just silly graphics few years ago Arctic Cat designed and it didnt look right with the sleds. The Panther graphics retro classic was pretty okay though. How about this for a name, "Classic Cat" for a leaf suspension Arctic Cat sled, 2 stroke, with 4/5th of size (similar to good old Pentera or Panther of the 70s). Also why not add new cat names such as LEOPARD! OCLET! There are more cats but do your homework! Research from National Geographic magazine and you will find more cat names! Google it too! Would also be nice to see leopard or tiger prints on seat as well. Need my help? Get in touch with me, Arctic Cat, Inc.! A mighty good feeling comes with a Cat designed by me! we love our CATS we have the 16 m8000 all black, 18 mountain cat and a Alpha.....only things we would is a chart for the cats an fox shocks...we have one but this should be in the owners manual...i hated the 16 till we found an online weight/pressure chart..now its set up to me and i can ride it..i like the all black so i would go back to a 16 LE look as an option...the CTEC is great and the 18s are flawless along with having a blast on the Alpha....we love the purple by the way...agree on the shorter snow flap..an the starter rope getting caught in the tether is getting caught ..reroute one of them....thicker decals...i have replaced my twice...next time just doing a stock look wrap..i love the 16 black..good job AC great sled.!! Need a 70-80 hp 4 stroke sled, something that will do 65mph but not be at full throttle to do it. You go from the ZR 3000 (wimpy) to the 7000. Wife wants all the heated options. I was hoping Arctic Cat would use the Yamaha 500cc 4 stroke. We currently have the 1100 4 stroke in need of a new one but nothing close from Arctic Cat to replace it. I'd like to see the Bearcat chassis set up to accept a two inch receiver front bumper, rear pintle hitch and also the huge utility rack like I have on my 2014 570XT. These options have allowed me to configure my sled into the perfect ice fishing machine. Why Arctic Cat went away from them is a mystery to me. Although I am a fan of four strokes, a bigger 2 stroke would be great for this machine. When I am on a remote Canadian lake I am fearful of relying on a battery for starting.